It may have entered bankruptcy protection in the US, but General Motors still has ambitious plans for India. The auto major is planning to develop a small car which will be its cheapest globally, at a possible price tag of under Rs 2 lakh. Nick Reilly, GM Group V-P, told TOI that the company was looking at developing a car from India that would be positioned below the 'Spark' mini car. "I would say we are studying that... and (we) do think there is an opportunity for something below the current mini car offering Spark," Reilly said in a conference call from Shanghai. However, it would "not be a Tata Nano equivalent", he added. While there is no independent confirmation, it is believed that the company is targeting a price tag below Rs 2 lakh for this car and apart from India, it could well be positioned in similar foreign markets like Latin America, Eastern Europe, Africa and even possibly China. Asked whether India would be the lead market for the R&D of the new car, he said "Yes, it is". Karl Slym, President of GM's Indian subsidiary, confirmed that any new car positioned below the Spark (costing Rs 2.66 lakh ex-showroom) would be the cheapest car for GM globally. "It (Spark) is currently the cheapest car for us globally," he said. 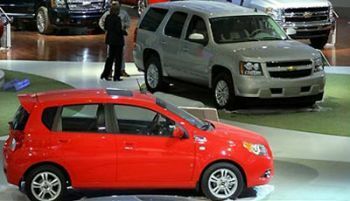 As it works its way out of bankruptcy in the US, GM has reiterated that markets like India and China would be key to its revival, especially when numbers remain depressed in home market US. Reilly also said small cars would be the key to growth in the future and GM would focus more on their development. Significantly, he said India can be a "very important source" for catering to small car demand from markets across the world, especially as it is primarily a mini car market itself. While components can be procured at "good value" and cheaply, GM's own upcoming engine plant could make the price attractive to serve other markets. "Therefore, a global growth in demand for small cars will give India an opportunity," Reilly said. The company plans to increase local content on its India-made cars to make them more competitive on the price front. Reilly added that news of the parent going bankrupt had impacted GM's sales in India while also making it difficult to raise money from financial institutions to fund its expansion plans. "We have seen some decline (in sales) in the Indian market in the last few months, obviously the market is weak. But mainly, I think, it was because of customers' response due to the widespread coverage on what was happening in the US."